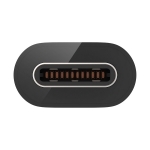 • In addition to the original charge cable supplied with your USB-C device, this adapter converts your existing Micro-USB cables to USB-C. Now you have a back-up cable that’s essential to charging up wherever you are. Ideal for charging in the car, at work, or on-the-go, this cable makes low battery anxiety a thing of the past. • The minimal design and high polish finish fit seamlessly with existing USB cables. The small, compact design makes this adapter easy to transport wherever you go. No matter where you go or what you need to charge, you’ll be covered. • This cable has been certified by USB-IF to meet all electrical, mechanical, and environmental standards, ensuring a superior user experience. USB-IF is a non-profit organization made up of companies that facilitate the development of high quality USB products and compliance testing. You can rest assured that your adapter is safe and reliable.